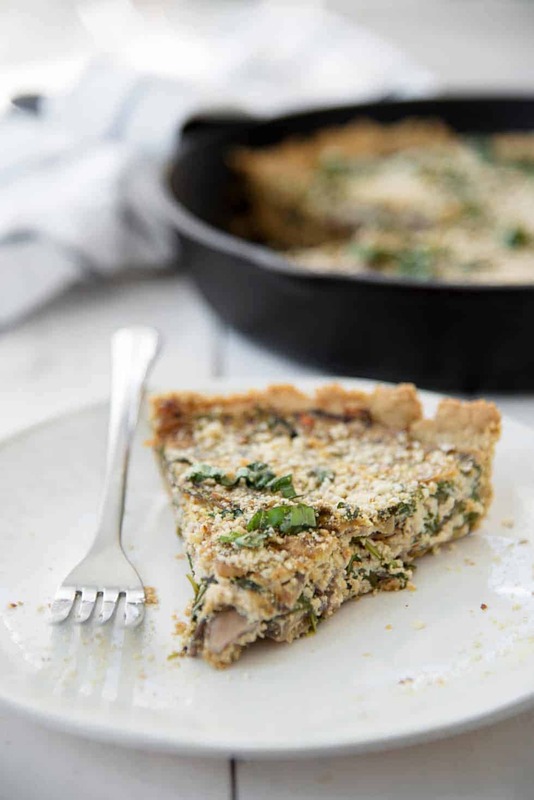 Vegan and Gluten-Free Arugula and Mushroom Quiche! Oat crust topped with mushroom and arugula tofu filling. Hearty meal, perfect for brunch, breakfast or dinner. It’s been a month of drinks, cookies, weeknight meals and holiday favorites. So I think we can fit in a dinner-worthy brunch meal, yeah? The month’s Recipe Redux theme is Grab a Book and Cook, so I picked up my two favorites: Oh She Glows and Vegan Brunch and got to work. Is there anything tofu can’t do? I’ve made tofu scramble at least a hundred times, but never tried it in a quiche version. But if both the above vegan cookbook goddesses attest to it’s deliciousness, I figured it was about time I gave it a shot. 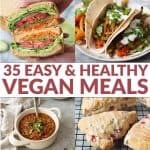 After watching Cowspiracy last month, I’ve been trying to eat as completely plant-based as possible. You know those things you know but not always present to? That’s how I feel after watching this movie. The reminder that the choices I make on my plate have far-reaching consequences, to the environment, food and nutrition policy and my health. Thankfully, tofu makes a pretty great stand in for eggs. Pureed with a bit of cashews, nooch, caramelized mushrooms and arugula, no one will be the wiser that this quiche is sans eggs. To up the nutrition profile, I used a oat and almond crust. 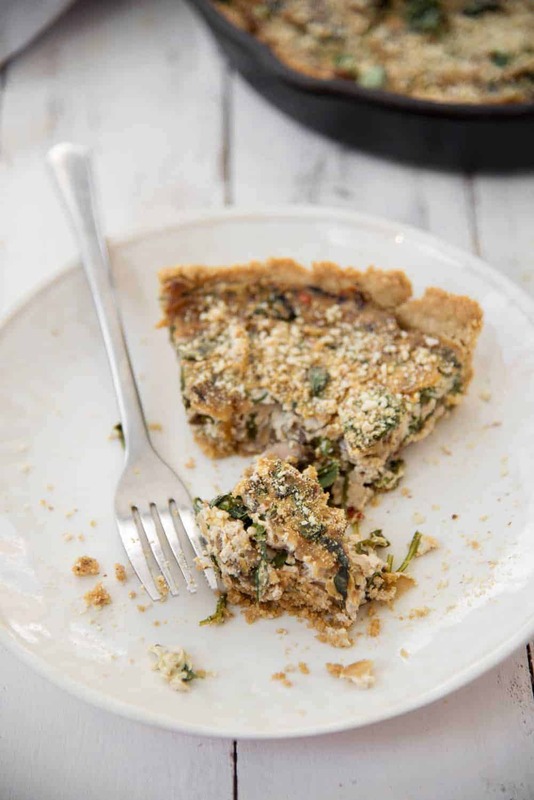 It’s a little more hearty than a regular pastry crust, and I like how the nutty crust pairs perfectly with the creamy tofu filling. I think this would be the perfect thing to make for Christmas morning, a lazy girls brunch or a simple dinner. 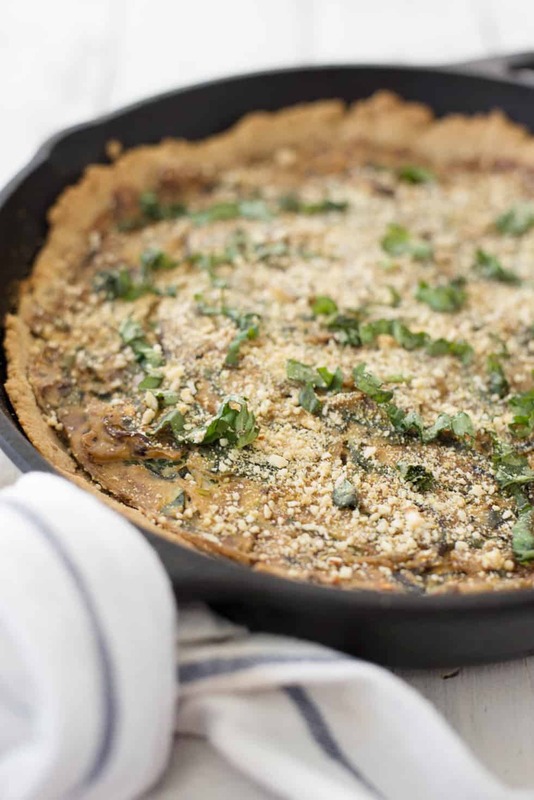 Make the quiche crust. Preheat the oven to 400 degrees F. Lightly spray a 9-inch pie dish with cooking spray. Whisk together the almond milk and vinegar in a small bowl. Set aside. Place the oats, flour, salt in the base of a food processor and pulse 5-7 times to combine. Add in the butter and pulse about 12-14 times, until a pebbly course texture forms. Add the milk mixture in and pulse 3 to 5 times more to combine. Roll the mixture into a ball and place an additional between 2 large pieces of parchment paper. Roll out into a circle about 10 inches in diameter. Remove the top sheet of parchment paper and transfer the crust to the pie dish. Peel off the parchment paper from the top of the crust in the dish and gently press the crust into the dish. Bake for 9 minutes then remove and let cool. Break apart the tofu block into large chunks and add to the base of a food processor along with the drained cashews. Process the tofu until smooth and creamy. Heat the olive oil in a large skillet over medium heat. Add the onion and garlic and cook until softened, about 5 minutes. Stir in the mushrooms, oregano, salt, pepper and red pepper, if using. Cook until mushrooms are browned and any liquid is gone. Stir in the chives, basil, arugula and nutritional yeast, stirring until arugula is just wilted. Remove from heat and add in the tofu-cashew combo until combined. Adjust seasonings, if needed. Add filling to the crust and smooth out with a spoon until even. Bake quiche, uncovered, at 350 F for 33-35 minutes, until the quiche is firm to the touch. Remove from oven and let cool for at least 15 minutes before slicing. Wrap up any leftovers and place in the fridge for for 3-4 days. Leftover quiche can be reheated in the oven on a baking sheet for about 10 minutes at 350F. 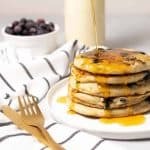 More yummy recipes from Recipe Reduxers below! Looks like a great recipe! I’m going to try it but need to replace the cashews with something other than a seed or a nut. Do you have a recommendation on what I could use (ie 1/4 cup mashed/whipped white beans)? Hi Sandy, I don’t see why beans wouldn’t work however, I haven’t tried it so I can’t say with a guarantee that white beans will work instead of cashews. If you try it and it works, please let me know.